Snapshot: The 1.7L Breville the Smart Kettle BKE825 has five pre-set temperatures plus an audible “water boiling” reminder. How noisy is it? Fast to boil one litre of water. Easy-to-use on/off switch on the base. The handle is very comfortable and the kettle doesn’t have to be tilted much towards the end of pouring. Five pre-set temperatures which are reasonably accurate. 20-minute keep-warm function for selected temperature. Has audible “water boiling” reminder. The water level isn’t easy to see. We contacted Breville in May 2016 regarding negative reviews we received about this kettle. Several members noted the lid on their kettle pops open unexpectedly, others had the clear plastic lens in the lid crack, and some found their kettle didn’t automatically shut off after boiling. Breville told us it was aware of these issues. A design change has been introduced in the electronic control system to address the boiling control issue. The lid opening mechanism design and tolerances have been adjusted to address the lid popping open. Manufacturing processes are being updated to control the lid lens cracking fault. Breville said it appreciates consumer feedback to continue improving product design and performance. 28 Nov 2018, Brett T.
We have had three of these over a year or so. Initially fine, then erratic behaviour as others have posted. When we took the second one back to Noel Leeming St Lukes, they refused to replace or refund until they phoned Breville, who insisted they test it instore. We waited for half an hour, and were then told that it was working fine, so that was the end of that - the problems were erratic and random. The store manager refused to talk to us, so after a heated discussion we were given the display model with a charming "There! Are you happy now?" The third one is now in the bin. Disgraceful. Had a good review on Consumer NZ. Supposed to work properly and be quiet. Electronics are erratic and, as other reviewers suggest, it beeps madly night and day. It was quiet at first but has become very noisey over time. Often takes two or three attempts to start it in the morning. For those who remember what was the disaster of British automotive engineering of the 1970s, it’s a product failure and the Austin Princess of Kettles! As soon as we learn of a quieter kettle it’s going in the rubbish. 08 Apr 2018, Rita M.
Beautiful brushed stainless steel finish, a classy looking jug. Have previously owned other Breville soft-tops, the best one was with the single water gauge underneath the handle because when flicked on, it would illuminate around the switch and also light the water gauge in the process. This smart kettle is quieter than my previous model and the lid opening flows easier, it pours well. It's concerning how many moans there are about the water continuing to boil longer and longer, I'm not experiencing this yet, I will be the first to moan to Breville if this occurs! Breville is recommended! Water gauge hard to see, nothing illuminates it despite another gauge being directly opposite on the other side, it's not enough light to show what water the level is. So many beeps is slightly annoying but at this stage, not so annoying I need to get rid of it. At this stage (one week in), I'm happy with my heavily reduced Easter w/end purchase. 07 Feb 2018, Peter D.
The kettle progressively takes longer and longer to turn off when set at 100 till eventually it no longer turns off. Very dangerous if someone unfamiliar with the jug turns it on and walks away. We are on our 3rd one and all have had the same issue. 09 Dec 2017, Johann S.
The lid sometimes sticks shut and then the only way to open it is with a sharp tap to the button. A frustrated housesitter once used an implement to try to pry it open and left dents in the edge. The automatic switch-off has gradually taken longer and longer - now it boils for ages before stopping. It also seems to have become more deranged with age, lighting up random buttons until one switches it off at the wall and back on again. It definitely doesn't like getting its base wet. And yes, it beeps and beeps. 24 Nov 2017, Anneliesje D.
It look fancy with all the different temperature choices but does anyone ever use them? This kettle beeps ALL the time. When you pick it up. put it back down. to start the boil, when finishing boiling, and now randomly beeps at all hours of the night when no-one is using it. If you live/sleep open plan then do not get this kettle. My family is going crazy. Time to get a different kettle. It seems to have plenty of life in it still but we are throwing in the towel on the beeps. 11 Nov 2017, Aidan W.
Beautiful design kettle. I have the light blue colour. It has an excellent pouring spout and push button lid. Not as quiet as I thought. Price - although I purchased mine for $80. 25 Feb 2017, Marg J. It was on sale so paid only $129. Does look good on my bench. That's where it ends for me sorry !!! Am pleased I kept my old one !!! The keep hot function only keeps it hot once and resets to off once you lift the kettle. It continuously beeps ... beeps when you lift the kettle off the base, when you turn off at the wall, when you turn on at the wall, when you return it to the base, when push start, when you choose a temperature and 3 times when it has boiled. The beeping has driven me to dispair and that's even before the thing is boiling !!!! The kettle is SOOOO loud. 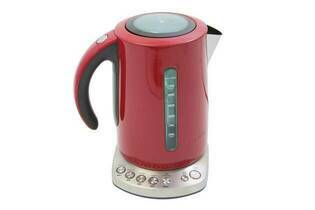 The loudest kettle I ever had!! I hate it!!! Summary - beeping noisy heavy machine. 01 Nov 2016, Kerie S.
The Keep Warm button is great, I use it often. Having different temperature levels is ideal, especially when boiling water for a hot water bottle. I see some people don't like the beeps, but I love them, reminds me when its done. The red looks great in my kitchen too!!! The water level is hard to read. After using it for some months, I'm still unable to get my husband to switch the temp buttons when making me a coffee/herbal tea, so that's still a work in progress!!! 29 Jun 2016, Lyddie H.
This kettle was most recommended by consumer for being quiet: However it beeps three times when it boils, beeps again every time jug taken off stand, beeps again every time replaced on stand. TOO NOISY AND ANNOYING FOR WORDS. I completed guarantee paper work on line with Breville, there was a section for constructive feedback so I put my thoughts in. Breville to their credit suggested I take their email back to the store and return product and get a refund, which I'm about to do! "Nice bells and whistles but poor components "
06 Jun 2016, Bryan G.
Looks good. Good options for different temperatures. When set to 100 it boils for ages. This has worsened over time. We've had it for about 18 months and now the buttons are playing up. Hard to see water level. 16 Mar 2016, John W.
05 Mar 2016, Dene M.
27 Jan 2016, Diane B. This is a really quiet kettle so the little beeps are good to let you know it is ready. I got the temperature control because this Breville model was quiet and was available on special. Now I use the temperature choice routinely. Very pleased. Angle of handle means some strain on my arthritic wrist but not enough to put me off the product. 19 Nov 2015, Beverley H.
We purchased this jug approximately 3 years ago and recently the interior of the lid cracked and became lose. This is a real hazard and as a steam burn is a strong possibility. We didn't find it quiet either! 01 Oct 2015, Kevin W.
While reasonably new it boiled quickly and reasonably quietly, and provided the temperature options on the buttons - we drink coffee and green tea, which are both provided for. The good features didn't last long enough to be reasonable value. The lid fails to close or stay closed, it became noisier, it would take a long time to approach lower temperatures as the element switched itself off and on multiple times, and finally the side glass window cracked, creating drips and puddles, and creating an electrical fault in the base. 26 Sep 2015, Paul T.
13 Sep 2015, Robin E.
Does what it says it will do and so far can't fault it. It's quick, quiet, next to no steam emission and the temperature presets are actually great. Thought they would be a waste of time but there not. Keep hot function is also great. For an extra $16 at Harvey Norman got an additional 2 years cover so as I see it we have a great kettle for at least the next four years. 17 Jul 2015, Simon M.
Fast boiling and very quiet. Preset temperatures are handy for green tea and coffee. As mentioned in other reviews on the odd occasion it will boil for an extended period when set to 100C. It has always turned itself off though. 11 May 2015, Lance S.
I bought one from Harvey Norman and it worked great for 6 months. Then the temperature settings started going off their set temperatures by going to boil instead of stopping at say 85 degrees. HN replaced this but said they would only do this once. The warranty confirmed that. The replacement one is now doing exactly the same after 9 months - 85 goes to boil, and 100 doesn't cut out which is dangerous if you're not keeping an eye on it. I don't know if I should get it looked at by appliance repairers as it's probably not worth it. Despite liking these it's not worth a 3rd go. 08 Apr 2015, Patricia K.
Temperature control - We had been looking for a long time to replace an old Shark kettle that had temperature control. Saw this on Consumer in December and read the negative reviews but decided to go ahead anyway as it has a 2 year guarantee. We have had no problems at all (so far) and really love the kettle. So thought another opinion would be fair. We use it mainly at 95C for tea and coffee but also use it at full boil. Yes, it does boil fiercely for some seconds before switching off at 100C, but we've had no problems as described by other users. 15 Jan 2015, B W B. Terrible build quality - Got three of these under warranty within a month, all had the same issue with the lid (it would just pop open when boiling or pouring). All three would also over-boil. 22 Dec 2014, Tristan B. Ours, like the others seems to keep on boiling when the 100' button is pushed on random occasions. We brought on sale so aren't to bothered. 25 Sep 2014, Mark S.
Works well for several months then starts staying on the boil for longer and longer. Sometimes the kitchen will be full of steam and it's still going. It's been replaced three times and still each new kettle develops the same fault. Major design/component fault. We are going to another model to stop steam cleaning the kitchen! "Great looking, quiet, well balanced and easy to pour." 14 Sep 2014, Stephen F.
It appears to be well ergonomically designed with an easy pour handle with no spillage and easy to fill. The temperature gauge / selector seems quite accurate making the perfect cup of tea, coffee and no doubt other hot beverages. It is also extremely quiet and rapid. It stopped working after two weeks (which made it even quieter still). As it stopped working I cannot recommend it (I have reverted to a $15 jug for the moment). Otherwise I would have awarded it 4 - 5 kiwis.